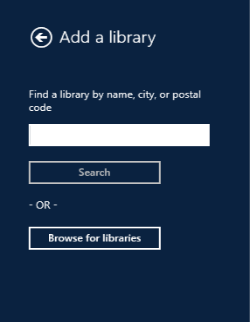 You can find and save your library's digital collection in OverDrive for Windows 8/10 using the steps below. From the app's home screen, click or tap the Add a library button. Search for your library by name, city, or postal code, or browse for libraries. Note: Searching by ZIP or postal code may be the quickest way to find your library. 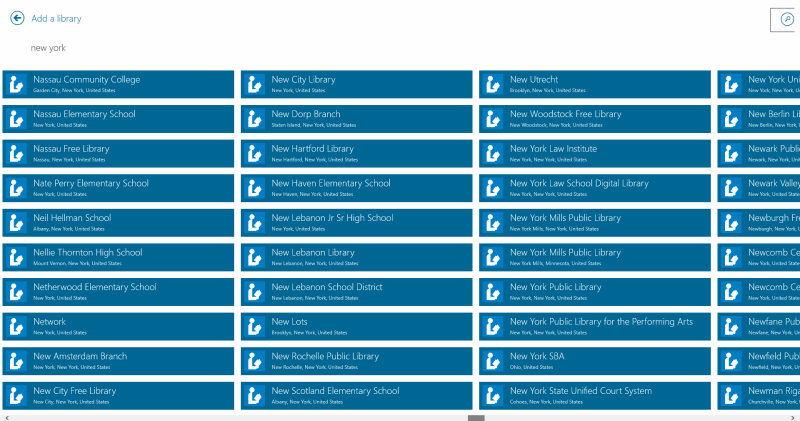 Select a library from the search results to open a list of digital collections for that library. Click or tap a digital collection to open it. It will automatically be added to your "My libraries" list in the app. You can continue browsing that digital collection, or click or tap the Back button in the top-left corner to return to the app home screen.